As mentioned, getting inside the Cubitek HPTX-ICE requires you to undo four small thumbscrews, which allows the door to be fully removed. This is easy enough to do, but it's more time consuming than it has to be. Inside, you'll find a massive motherboard tray that is non-removable -- though that's okay, given how spacious the HPTX-ICE is. Towards the front are seven 3.5" drive bays with one 3.5" to 2.5" adapter for a pair of SSDs. Above the HDD bays are five 5.25" bays and the bottom two are populated with an adapter for another two 3.5" drives. 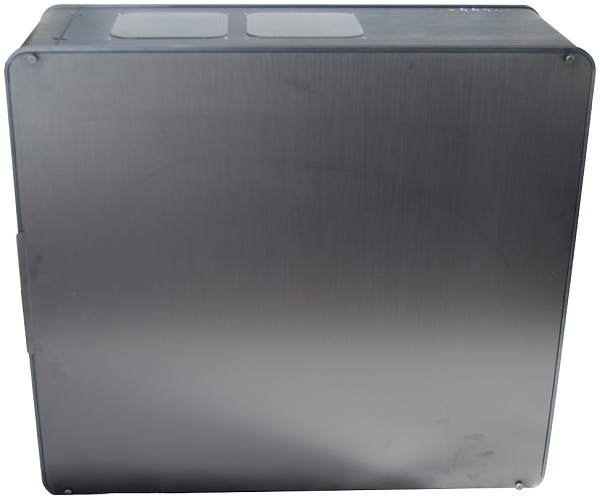 In total, the HPTX-ICE supports five 5.25" drives, nine 3.5" drives and two 2.5" drives out of the box. 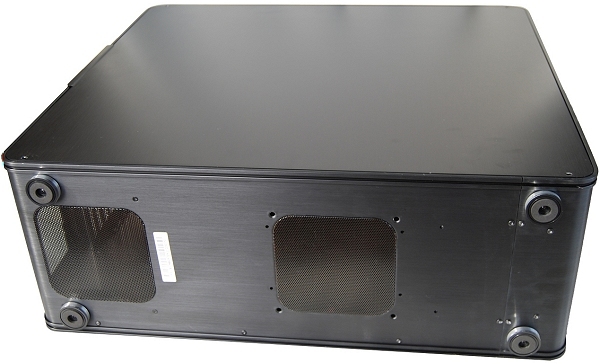 Moving to the back, there are ten ventilated expansion brackets and a power supply mount. There's also a 120mm black fan that uses a 3-pin power connector and is rated at 38.83 CFM. Speaking of fans, there's also a front-mounted 200mm blue LED intake fan with a flow rate of 57.76 CFM. 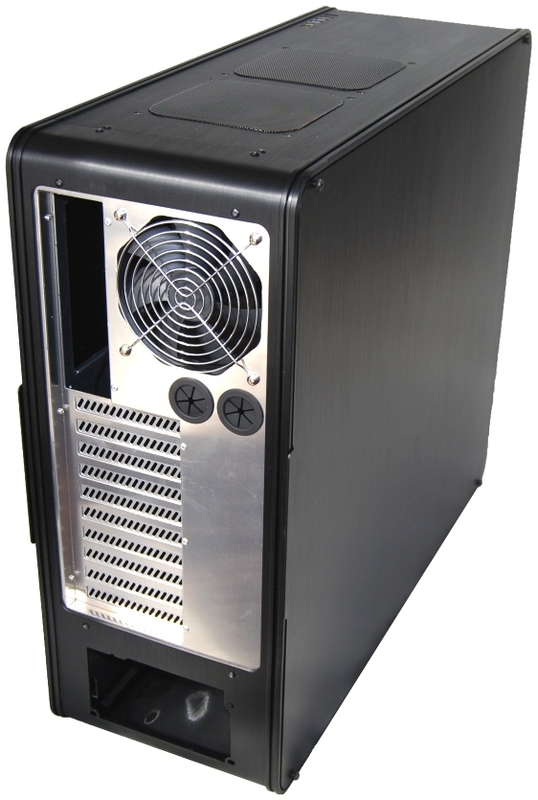 Cubitek also installed a pair of 140mm blue LED fans into the top of the case, and while they call these "outflow" fans, our review sample came with one mounted as an intake and the other as an exhaust. Both are rated at 49.05 CFM and use a 3-pin connector. 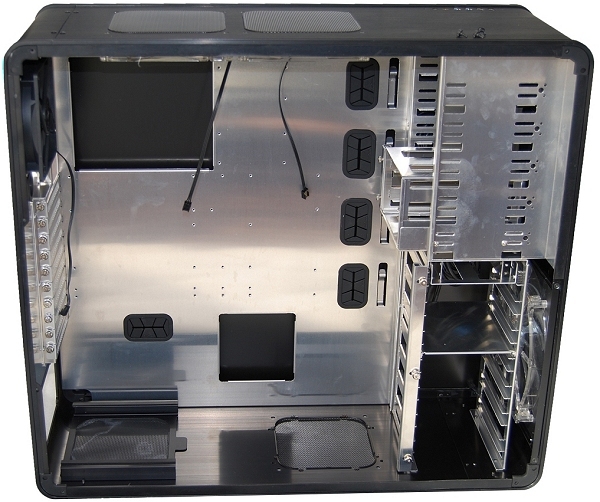 If that's not enough airflow, you can install a 140mm fan in the bottom of the case. 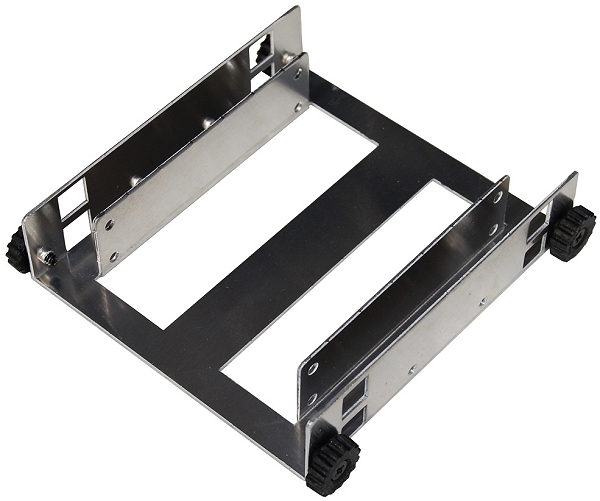 Alternatively, the movable 3.5" hard drive cage can be placed here, freeing up the 5.25" bay area. Even with the HDD cage at the bottom, the HPTX-ICE has enough room for a 220m (8.6") long PSU, which covers just about everything available. 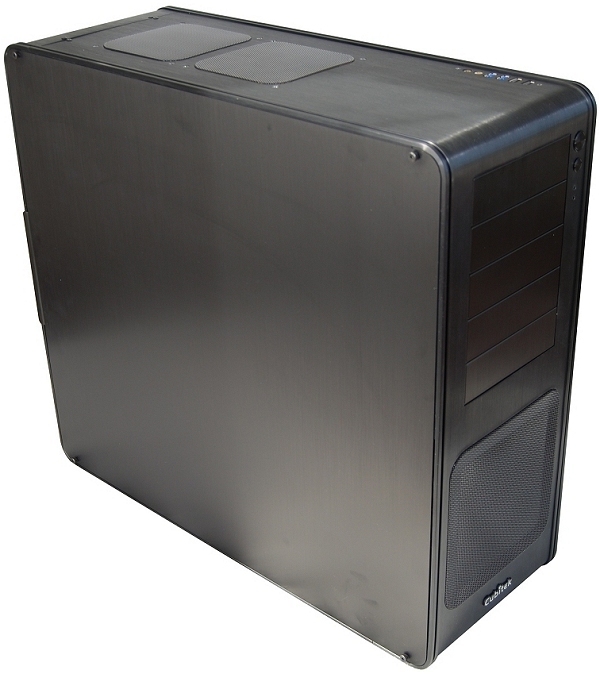 The case also has 17" (433mm) for graphics cards, loads of space considering the longest cards only measure around 11". 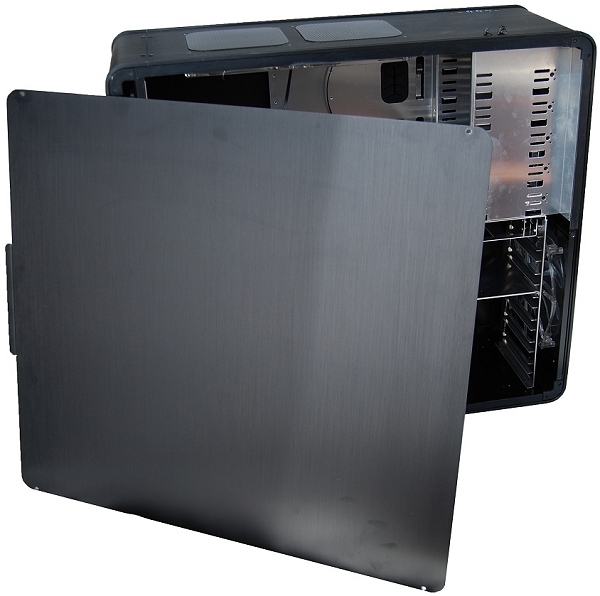 Likewise, CPU coolers up to 7" (180mm) tall are covered. For its size, the HPTX-ICE seems a little stingy on cable management. Unlike the Corsair 800D, the HPTX-ICE's motherboard tray doesn't provide holes for ATX boards, so cables have to stretch further than they should. There also isn't as much room behind the motherboard tray as we would've liked. 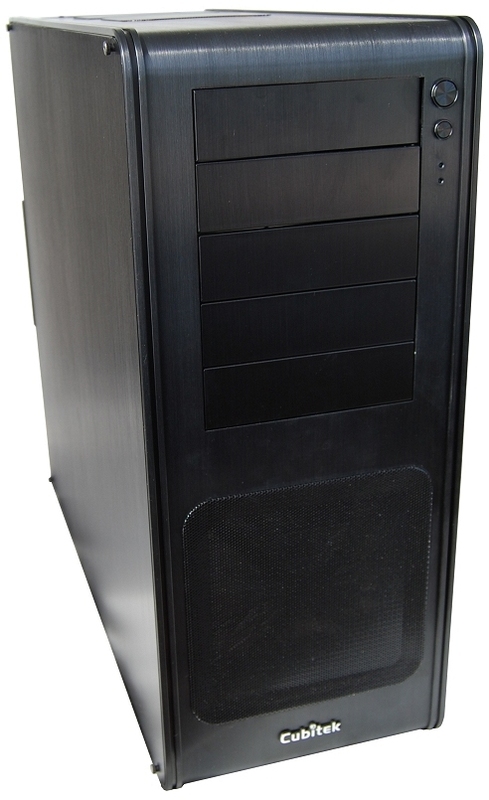 Companies such as Cooler Master solve this issue by being creative with concaved doors. The HPTX-ICE is also missing a fan speed controller and some form of a tool-less design. Although Cubitek says it provides anti-vibration and tool-less elements for the hard drives, this is not entirely true. There is an anti-vibration design, but it's far from tool-less. Each drive requires four screws and four rubber grommets before being installed, and that calls for a screwdriver. That said, we like the anti-vibration implementation and tool-less or not, it works well.